Eagles quarterback Carson Wentz scrambles with the football during the third-quarter against the New York Giants on Thursday, October 11, 2018 in East Rutherford, NJ. EAST RUTHERFORD, N.J. – The pocket collapsed, Carson Wentz escaped, and rolled to his right. He kept looking and looking. The clocked ticked — four seconds, five seconds, six-and-half seconds — before the quarterback threw across his body to the late-arriving Alshon Jeffery. Does Wentz occasionally hold the ball too long? Heck, yeah. When he can extend plays as he did on a 13-yard touchdown pass to Jeffery on the opening drive of the Eagles' 34-13 romp over the New York Giants Thursday night, a few sacks will be tolerated. "There's good plays and bad plays that come from it," Wentz said. "So sometimes you got to live with it. Tonight we fortunately made some good ones." 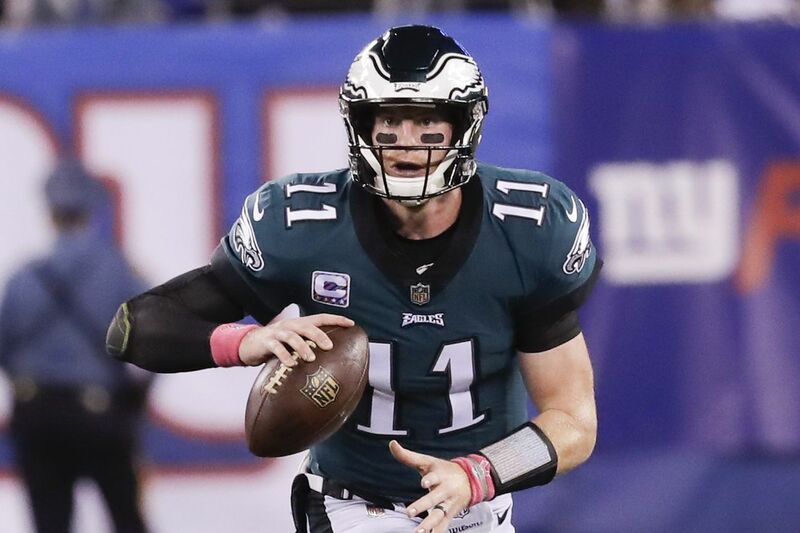 In truth, Wentz hasn't been holding the ball any longer than he did last year, despite what tackle Jason Peters said after Sunday's loss to the Vikings. His protection just hasn't been as sound and the offense had been sputtering since his return three weeks ago. There were other reasons for the Eagles' 2-3 start, of course. But Wentz was the least of the problems despite a minority narrative that he was rusty following a 9-1/2-month absence. If there was any doubt, however, that he was back to his 2017 self — to the elite talent that some believe could make him the best at his position — it was erased before midnight. "He really did a nice job just sort of executing the offense," Eagles coach Doug Pederson said. "… Maybe not taking care of the ball a couple times, but that's OK, we ended up with the win." Wentz completed 26 of 36 passes (72.2 percentage) for 278 yards and tossed three touchdowns without a turnover in his best game so far this season. The Eagles had failed to eclipse the 23-point barrier in their first five games – something they accomplished 12 times last year – but they scored 24 by the half and 31 by the end of the third. If there was a key to offensive success – aside from the 1-5 Giants' and quarterback Eli Manning's ineptitude – it was the Eagles finally getting out to an early lead and sustaining it through the first 30 minutes. They scored 14 points in the first stanza, double the amount they had totaled in their first five games. "Everyone's a more dynamic team when you have the lead," Wentz said. "The defense kind of feeds off that. … We preach start fast and tonight we finally did that." Jim Schwartz's defense earned an assist for the first score. Linebacker Jordan Hicks deflected a pass to Kamu Grugier-Hill for an interception and after a 24-yard return the Eagles were 16 yards from pay dirt. Three plays later, Wentz connected with Jeffery for the first of two third down touchdown passes to the receiver. "He was actually the first read but they had him double covered," Wentz said. "They really had everything else covered well. So the o-line did a great job of holding up. And down there when we're in the red zone, sometimes you just got to improvise. It's not always the smartest thing to throw back across your body, but when you got a guy like Alshon in the back of the end zone, you can really trust him to make a play." The Eagles extended their lead to 14-3 two drives later after a DeAndre Carter 23-yard punt return gave them a short field. The offense sputtered for the next few drives, but the lead allowed Pederson to establish the run and set up play-action. We had yet to see the full fury of his offense, because the Eagles have trailed for most of the season. But the table was set midway through the second quarter on second down. Wentz faked a handoff to running back Wendell Smallwood and turned naked to his right. The Eagles moved the pocket and the additional time allowed receiver Nelson Agholor to break off his route. Wentz found him alone and 58 yards later the Eagles were down to the Giants 10. Pederson wasted little time. He threw out of three-tight end set that isolated Zach Ertz alone against Janoris Jenkins. With a post-corner double move, Ertz lost the cornerback and Wentz hit him in stride for another touchdown. The Eagles added a field goal on their ensuing drive, and opened the second half with a 12-play, 75-yard series that put on exclamation point on the proceedings. Wentz completed 5 of 6 passes for 48 yards – the last a 1-yard strike to Jeffery – and scrambled once for nine yards. Pederson, true to his word when staked a lead, called five runs on the possession. The offensive line, buoyed by the full menu of plays, rebounded from a slow start. With right tackle Lane Johnson playing on a high ankle sprain, and left tackle Jason Peters batting a quadriceps strain, the unit came into the game at less than 100 percent. It was apparent on the first several drives as Wentz endured a bevy of hits. In his previous three games, he took 25 hits — the third-most among quarterbacks over that span. He was sacked 12 times. Peters said that Wentz wanted to hold the ball longer coming off his injury and that the line just had to block longer. But that wasn't case. Wentz's numbers in time to throw (2.56) and time in the pocket (2.73) were almost identical to last season (2.54 and 2.75). Were there a few moments when he could have gotten rid of the ball quicker or simply thrown it away? Sure. There was a third quarter sack Thursday — the Giants' lone takedown of Wentz — that might have been unnecessary. He is at least cognizant of it. But Wentz has more than compensated with the ability to extend plays with his feet and athleticism. "I know it's got to be frustrating for a defense," Jeffery said. The Eagles didn't need one of his spectacular feats of feet against the Giants. The first Jeffery touchdown was about as magical Wentz would get, or need to get. But with Johnson, who hobbled off in the third quarter, and Peters, who left with bicep injury, battling injury, and the line still working out the kinks, Pederson will likely need Wentz magic as the season progresses. For the first time this season, the Eagles looked like the 2017 Eagles. It may be momentary. But Wentz is anything but fleeting. His coaches understand as much. Wentz was asked what they had to say to him after he threw across his body to Jeffery. "Nothing," Wentz said. "Good play."